Although they're still best known for 2008's "Ain't No Rest for the Wicked" (from their eponymous debut LP), Kentucky indie/alternative rock sextet Cage the Elephant has produced enough worthwhile material in the ensuing years to deserve escaping the shadow of that pop culture heavyweight. True, they've never really released anything outstanding in terms of resonant songwriting or daring variability, but their formula has remained strongly characteristic and enjoyable nonetheless. The same holds true for their latest studio outing, Social Cues, a satisfying collection of glitzy anthems, breezy vibes, and even some earnestly introspective highlights that showcase technical and creative maturity amid a continuation of that efficacious recipe. From the start, Social Cues impresses with its production courtesy of John Hill, whose work with venerated peers like Florence + The Machine and Portugal. The Man speaks for itself. Opener "Broken Boy" immediately dishes out dissonant energy and ethereality before channeling 1960s surf rock attitude via sharp, overlapping guitar chords and steadfast rhythms. Blended with vocalist Matt Shultz's trademark presence, a fusion of 1970s punk attitude and classic Mick Jagger swagger, it's a superficial yet sufficiently gripping good time. Likewise, the consequent title track is lighter and more danceable in terms of both mix and melodies, whereas "Night Running" is funky and spacey, entrancing the listener in easygoing colorfulness and—thanks to special guest Beck—warmly chill vocals. Further along, "House of Glass" feels like an aggressive amalgamation of Super Furry Animals and the Last Shadow Puppets, and the punchy "Tokyo Smoke" is lovingly ornamented by inventive effects and luscious synths amongst its resolute accessibility. While most of the sequence is exteriorly appealing, a few cuts manage to dig deeper into your heart and soul. For instance, "Skin and Bones" is touchingly thoughtful as tempo and temperamental shifts gloriously cascade around Shultz's browbeaten realizations. "I've been running for so long / All that's left is skin and bones / Close my eyes, fight to carry on / Sometimes it makes no sense at all". Afterward, both "Love's the Only Way" and "What I'm Becoming" are exquisitely symphonic and subdued odes that find him voicing existential quandaries with impactful isolation. Likely the greatest bit of songwriting comes at the end, however, with closer "Goodbye". A sparse, echoey piano ballad that builds a bit as it goes, its unsheltered confessions are relentlessly arresting and beautiful. "So many things I wanna say to you / So many sleepless nights I prayed for you." It's here that Cage the Elephant truly capitalize on their potential as poignant craftsmen. Not everything on Social Cues is commendable, though, as there are some relative duds in the fold. The overly processed "Black Madonna" is apathetically adequate in every way, while "Ready to Let Go" seems like a song they—and many styptic siblings—have made many times already. It's pleasing enough, sure, but it also oozes surface-level familiarity as well. Sadly, the same can be said of "The War Is Over", an upbeat, almost flowery tune that just kind of meanders along without doing anything of significance in any category. None of these pieces are bad, per se, but they are at least slightly lackluster when heard alongside the rest of the record. 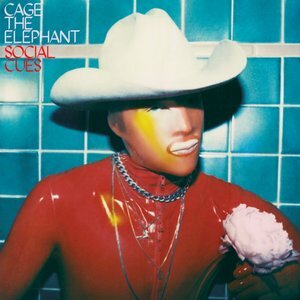 That said, Social Cues is easily one of Cage the Elephant's best efforts. Aside from a few uninspiring entries, every inclusion offers something valuable, be it fetchingly catchy radiance or notably moving self-reflection. Above all else, the band manages to keep a somewhat limited method interesting and likable after over a decade of ingenuity. That alone means Social Cues will make longtime fans happy.